I made a headboard last week. We've been sleeping on the floor for 3 years. Okay, not ON the floor, but the box springs are on the floor. When we moved from Key West, the bed was on it's last legs and we elected not to drag it with us and have it likely deteriorate further. The aging dog really enjoyed being able to get on the bed easier (he has since passed away - in the beginning of September) and the cats and skunk appreciate the accessibility as well. I am fine with the bed being low to the ground, that doesn't bother me. Having no space UNDER the bed is ok, too, as there is then nowhere for things to get lost or small animals to hide. It has always seemed to me that a headboard makes a bed look "real". When we dumped the old bed, we agreed that we would not purchase any bedroom furniture unless it was what we really loved, and we would save up for it. Working at P1 gave me the opportunity to pick up some very nice coordinating pieces for pretty affordable prices, but they never had a headboard and/or bed that was quite right. 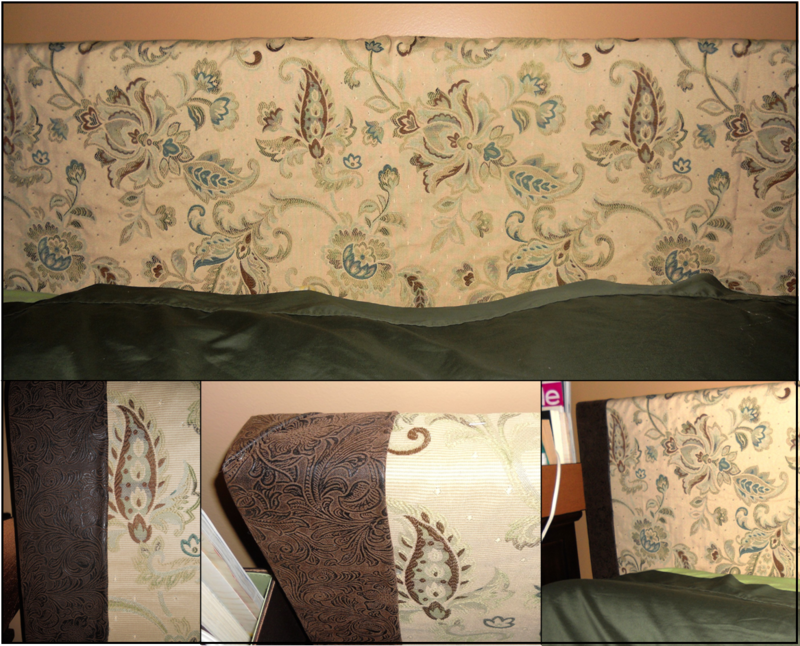 I decided a few months ago that I would just MAKE a headboard. I've seen DIY stuff on HGTV showing the many different ways of creating the beast, so I decided to do the cheapest/lightest/nicest looking thing and this is the result. I purchased four pieces of foam-board that are 1/2" thick and laid them next to each other, placing five 1" dowels (are they still dowels if they are square?) on the ends and on the seams, adding 1/2" dowels across the tops for reinforcement and two more 1/2" in strategic (and clearly scientific) positions, hot gluing them all into position. It was originally my intention to nail the wood pieces together, but the nails I had were too thick and started to split the wood, so I decided a hot-glue-and-staple-gun route was better. I also stapled the seams between the foam pieces on the front side to help keep them together. Time for batting and fabric! I bought one bag of quilt batting in a Twin bed size, which turned out to be perfect when folded in half long-wise. Used the staple gun to attach the batting to the form, down the center and all around the edges. I laid out my fabric and discovered that when I had calculated how much I would need, I had been intending to use the foam boards the other direction, which was shorter. Oops. I went ahead and fastened it (staple-gun of course) in a centered position, leaving equal sized blanks strips on the ends. Fortunately I have some lovely fabric from my still-planned third incarnation of the big ottoman. The craft store always has it in stock, so I can pick up more if I need to. I cut two strips off an end, folded and hot-glued the edge, then hot-glued AND stapled the strips on the ends of the headboard. I have to say, it kinda looks like I meant to do that, and I think I like the look of it better than if the light-colored fabric had reached all the way to the end. Right now, the headboard is just on the floor (the 1" dowels make great feet to hold the thing up at the perfect height) between the bed and the wall, but it's lightweight enough that I can hang it on the wall if we ever raise the bed and build/buy a bed frame.